It has been an exciting year for my team. Last year we kicked off a project using React, and over the course of the project we’ve learned a lot about React and Flux — Facebook’s recommended architectural principles for React apps. In this article, we’ll take a look at some of the key lessons we’ve learned. Whether you’re new to React and Flux, or going as far as building your own Flux implementation, I think you’ll not only enjoy this journey with us, but find some thought-provoking questions and wisdom you can apply in your own endeavors. It has been an exciting year for my team. Last year we kicked off a project using React, and over the course of the project we’ve learned a lot about React and Flux — Facebook’s recommended architectural principles for React apps. In this article, we’ll take a look at some of the key lessons we’ve learned. Whether you’re new to React and Flux, or going as far as building your own Flux implementation, I think you’ll not only enjoy this journey with us, but find some thought-provoking questions and wisdom you can apply in your own endeavors. This post assumes you have some level of familiarity with React and Flux. Already familiar with them? Feel free to skip to “Introducing Lux.js” section. Otherwise, I recommend reading through the links below. React UIs are built out of components. React components render to a virtual DOM. Subsequent renders are “diffed” with the previous render, and the minimum number of DOM mutations are executed to effectively patch the DOM to bring it up to date. Check out Facebook’s Getting Started guide. Flux apps have three main abstractions: views (React components), stores, and the dispatcher. Views “propagate” actions (e.g. user interaction) through the dispatcher. The dispatcher handles notifying the various stores of the action. If a store’s state changes, it emits a change event, and views depending on that store for state will rerender. Check out Facebook’s overview of Flux. Don’t get in React’s way. Treat every input as an action. Store operations must be synchronous. Make it easy to play well with non-lux/non-React instances. Dmitri Voronianski created flux-comparison, which lets you see a side-by-side comparison of several flux variants (using a basic shopping cart example). I’ve implemented the same example using lux to help illustrate the explanations along the way. I highly recommend checking this project out — it’s a great way to quickly familiarize yourself with several leading Flux implementations. OK, with all that out of the way, let’s look closer at the qualities I mentioned above. React does a great job at focusing only on what it aims to solve. By not being prescriptive on broader things like remote data communications (HTTP, WebSockets), and by providing hooks that enable you to incorporate non-React UI libraries, React gives you the opportunity to assemble the tools that best address the needs of your app. Just as React stays out of the way of concerns it doesn’t solve for, we’ve found it’s equally important to stay out of React’s way. It’s easy to get in the way as you begin abstracting common patterns in how you use another library/framework behind your own API. (Note: this isn’t always a bad thing!) For example, let’s look at the common component behaviors we’ve built into lux, and how our usage of them has evolved. You will often hear React developers refer to controller views — a React component that typically sits at or near the top of a section of the page, which listens to one or more stores for changes in their state. As stores emit change events, the controller view updates with the new state and passes changes down to its children via props. Either approach is valid, though we feel the second approach is more out of React’s way. Why? We get a component’s displayName for free (as the JSX transformer will use our var name when it sees React.createClass). Some controller views don’t need to be ActionCreators. The second approach means we could only pass the store mixin in those cases, keeping concerns focused. The first approach always gives the component both mixins, even if not used. There’s no need to explicitly pass the React instance to lux (done via lux.initReact( React )) so that it knows how to create components. Note: Why spend time explaining these two different approaches? It’s about staying out of React’s way. We can easily fall prey to either over- or underabstracting, thus we need to give ourselves room to adapt as our understanding improves. The evolution of our approach over time has been informed as we’ve asked ourselves what makes a good flux implementation. This process of continually questioning and evaluating is a vital part of the life of any library or framework. When our ProductsListContainer stands up, it will be ready to listen to any of the store namespaces provided in the stores.listenTo array, and those subscriptions will be removed if the component unmounts. Goodbye boilerplate! You’ll notice two things in the code above: first, the use of lux.actionCreator, which mixes lux.mixin.actionCreator into the target; and second, the publishAction method (provided by the mixin). Matching action type names and store handler names made conventional wire-up very simple, but we saw another area where we could eliminate boilerplate: if 99% of our ActionCreator API implementations just published a message, why not infer creation of ActionCreator APIs based on what gets handled by stores? So we did, while still allowing custom implementations of ActionCreator methods where needed. For example, when the store instance in the snippet above is created, lux will see that it handles an addToCart action. If an ActionCreator API hasn’t already been defined for this action under lux.actions, lux will create one, with the default behavior of publishing the action message. Taking this approach means our components can specify what ActionCreator methods they want in an à-la-carte style. In this next snippet, our ProductItemContainer is using the lux.reactMixin.actionCreator mixin, which looks for a getActions array, and provides the specified actions as top level methods on the component. You can see we’re using the addToCart ActionCreator method in the onAddToCartClicked handler method. As with any convention, there are trade-offs. Composition is an important aspect of ActionCreator APIs. They should be modeled separate from the component(s) that use them. So far, we believe this approach upholds that, while trading some of the explicit nature (e.g. keeping ActionCreators in their own module) for flexibility and terseness. Since this behavior of providing ActionCreator APIs was abstracted into a mixin, it made it possible for both React components as well as non-lux/React instances to use the mixin. My team has been taking advantage of this when it comes to things like remote data APIs. 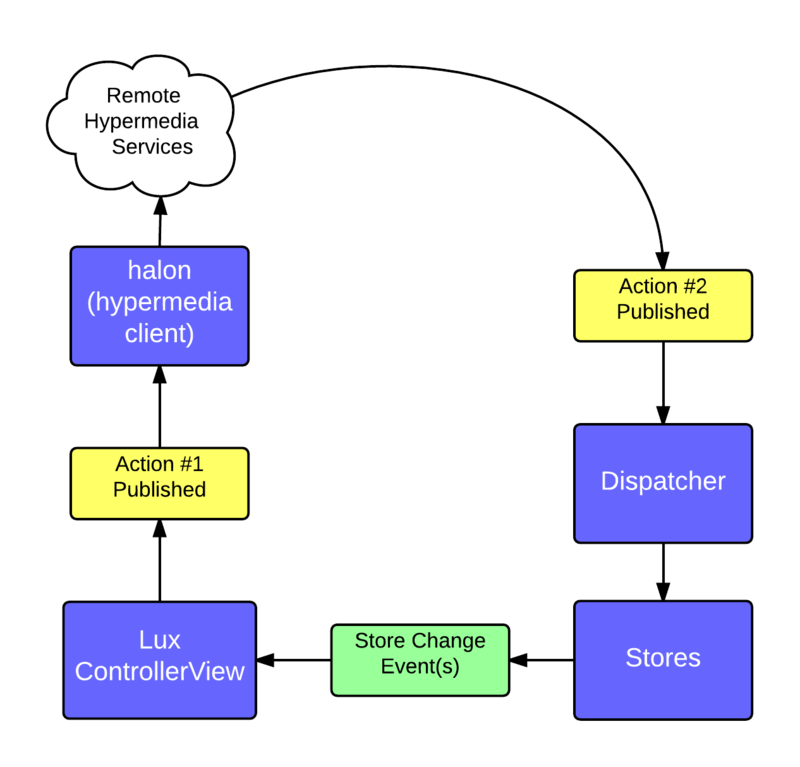 We’re using a hypermedia client called halon, which understands how to consume our hypermedia resources using an extended version of HAL (Hypermedia Application Language, an open specification for defining the structure of HTTP resources). Covering hypermedia is beyond the scope of this article, but a number of good resources exist if you’re interested in learning more. Our client-side wrapper for halon uses lux’s actionCreator and actionListener mixins so that it can not only publish actions, but also handle them. We approach it this way because we believe every input — whether it be user input or queued asynchronous execution (via Ajax, postMessage, WebSockets, etc.) — should be fed into the client as an action. If you’ve kept up with any of the React discussions over time, you might be thinking, “Jim, Facebook is OK with calling dispatch directly on an XHR response, rather than use another ActionCreator”. Absolutely — and that makes perfect sense when your implementation gives your util modules (like remote data APIs) a handle to the dispatcher. With lux, we opted for the gateway to the dispatcher to be via message contract, and removed the need for the dispatcher to be a dependency of any module. In the above scenario, a user clicked a button on the page that resulted in a server request. When the server responds, the response is published as a new action. While we know that the two actions are related, modeling things this way reinforces the avoidance of cascading updates, and it means your app’s behavior will be capable of handling data being pushed to it, not just pulled through HTTP requests. // other methods, properties, etc. Retrieving data from a store was an asynchronous operation, so it wasn’t possible to synchronously use a store’s state in a controller ciew’s getInitialState method. We found that requiring asynchronous reads of store state discouraged the use of read-only helper methods on stores. Putting I/O in stores led to actions being initiated by stores (e.g. on XHR responses or WebSocket events). This quickly undermined the gains from unidirectional data flow. Flux stores publishing their own actions could lead to cascading updates — the very thing we wanted to avoid! I think the temptation to fall into this pit has to do with the trend of client-side frameworks to date. Client-side models are often treated as write-through caches for server-side data. Complex server/client synchronization tools have sprung up, effectively encouraging a sort of two-way binding across the server/client divide. Yoda said it best: you must unlearn what you have learned. About the time I realized I’d be better off making lux stores synchronous, I read Reto Schläpfer’s post “Async requests with React.js and Flux, revisited”. He had experienced the same pain, and the same realization. Making lux stores synchronous, from the moment the dispatcher begins handling an action to the moment stores emit change events, made our app more deterministic and enabled our controller views to synchronously read store state as they initialized. We finally felt like we’d found the droids we were looking for. // this can be used to redirect to success page, etc. You can also set initial state on the store, as we’re doing above, and provide top-level methods that are used for reading data (the lux store prototype provides the getState() method). Since store handlers execute synchronously, you can safely read a store’s state from any component’s getInitialState method, and you can be assured that no other action will interrupt or mutate store state while another action is being handled. lux stores also provide setState and replaceState methods, but if you attempt to invoke them directly, an exception will be thrown. Those methods can only be invoked during a dispatch cycle; we put this rather heavy-handed opinion in place to reinforce the guideline that only stores mutate their own state, and that’s done in a handler. Another key lesson for our team: it needs to be simple for lux and non-React/non-lux (external) instances to play well together. To that end, lux provides mixins that can be used by external instances. The above module listens for the cartCheckout and getAllProducts actions. As it handles them, it uses the publishAction method (simulating how a server response would initiate a new Action). So far, the mixins have covered every need we’ve had to make non-lux/non-React instances play well with lux. If those weren’t enough, though, the underlying message contracts for actions and store update notifications are very simple, and could serve as an alternative. In fact, we plan to use those in some future Chrome dev tools extensions for lux. As I’ve looked through other Flux implementations, I’ve been encouraged to see that these principles are frequently present in them as well. The number of options available can feel overwhelming, but overall I find it an encouraging development. Solid and successful patterns like Flux will, by their very nature, encourage multiple implementations. If our experience is any indication, keeping these principles in mind can help guide you as you select, or write, the Flux implementation you need.